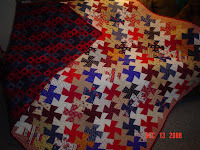 I have recently completed my latest quilting project -- one I started on May 31st of this year when I took a class. The pattern is called "Square Dance". Check back to my blog post of June 2nd for the first picture I posted of this quilt. To make it, I had to first piece together 6-1/2 inch blocks plus a border; I had to cut it apart to make the above. I really like this quilt and would be tempted to keep it if it wasn't planned for a special gift for someone!